The Second Annual International Conference on the Blues promises to bring legendary entertainment and academics to Delta State University on Monday, Oct. 5 and Tuesday, Oct. 6, including GRAMMY award-winning Blues artist Dom Flemons, former National Endowment for the Humanities chairman Dr. William Ferris, an historic statewide proclamation honoring B.B. King and a free performance from GRAMMY-nominated Blues musician Bobby Rush and Mississippi Governor’s Award-winning Blues musician James “Super Chikan” Johnson. The conference, which is still open for registration, brings together Blues scholars, historians and fans from all over the United States in the heart of the Mississippi Delta, a place known as the epicenter of Blues music and history. * and “The Storytellers featuring Bobby Rush and Super Chikan: Up Close and Personal”, a free public concert sponsored by the International Delta Blues Project and the Bologna Performing Arts Center. Visit here for a complete schedule of events, or here for a complete list of presenters. The second annual conference is part of the International Delta Blues Project, which is funded by the Robert M. Hearin Foundation and is based at The Delta Center for Culture and Learning. The conference is being managed by a team of campus and community collaborators including the Delta Music Institute, the Department of Music, the Division of Languages & Literature, the Office of Institutional Grants, and Cleveland Tourism. Flemons who is known the “American Songster,” has performed music professionally since 2005 and has played live for over one million people just within the past three years. As part of the Carolina Chocolate Drops, which he co-founded with Rhiannon Giddens and Justin Robinson, he has played at a variety of festivals spanning from the Newport Folk Festival to Bonnaroo, in addition to renowned venues such as the Grand Ole Opry. Ferris, a widely recognized leader in Southern studies, African American music, and folklore, is the Joel R. Williamson Eminent Professor of History at the University of North Carolina at Chapel Hill and the senior associate director of UNC’s Center for the Study of the American South. He is also adjunct professor in the curriculum on folklore. The former chairman of the National Endowment for the Humanities, Ferris has conducted thousands of interviews with musicians ranging from the famous (B.B. King) to the unrecognized (Parchman Penitentiary inmates working in the fields). He has written or edited 10 books and created 15 documentary films. Mitchell said the appearance by Flemons expected to be an exciting part of the conference. “Dom Flemons is known for his work with the Carolina Chocolate Drops, but he is also a walking American songbook, and his knowledge and expertise in playing the country Blues and classic Blues is phenomenal,” Mitchell said. This year’s conference promises to build on the vision established for the event when it began last year, Mitchell added. For more information, please contact Mitchell and Collins at blues@deltastate.edu. The mission of The Delta Center is to promote greater understanding of Mississippi Delta culture and history and its significance to the world through education, partnerships and community engagement. The Delta Center is the home of the International Delta Blues Project and serves as the management entity of the Mississippi Delta National Heritage Area. For more information, visit http://www.deltastate.edu/academics/delta-center-for-culture-and-learning/. Lee Aylward (second from right) of the Delta Center for Culture and Learning recently hosted a tour for the Hillel Jewish student group from the University of Virginia. They visited various Delta sites, including the "Cast of Blues," a collection of 54 blues masks found in the lobby of Ewing Hall at Delta State. The Delta Center for Culture and Learning at Delta State University recently hosted members of the Hillel Jewish student group at the University of Virginia. Hillel is the largest Jewish student organization in the world. By participating in life-changing trips and campus initiatives, students learn to make a meaningful impact on the future of people and the world while they grow intellectually, socially, and spiritually. The Delta Center’s Lee Aylward provided a Delta tour to significant sites in the Delta, and director Dr. Rolando Herts gave them an overview of the Mississippi Delta National Heritage Area. The group will spend time throughout the Delta for a week conducting service projects and learning about the different communities. The mission of The Delta Center is to promote greater understanding of Mississippi Delta culture and history and its significance to the world through education, partnerships and community engagement. The Delta Center serves as the management entity of the Mississippi Delta National Heritage Area and is the home of the International Delta Blues Project. For more information, visit http://www.deltastate.edu/academics/delta-center-for-culture-and-learning/. 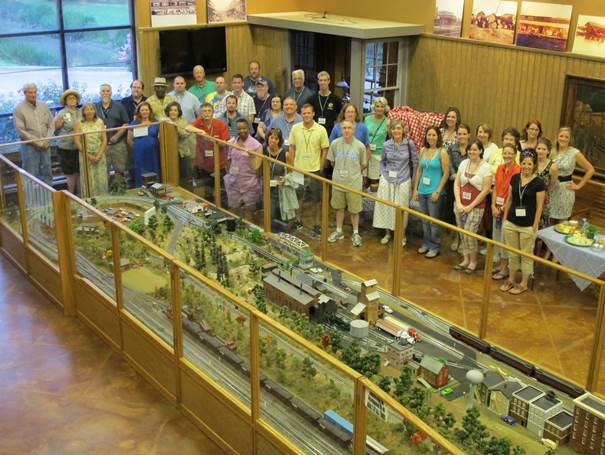 Participants and staff of the June, 2014 Most Southern Place workshop stopped for a photo at the 1927 Flood Museum in Greenville. For the sixth year, Delta State University has received major funding from the National Endowment for the Humanities Landmarks in American History and Culture program. Funding will allow the Delta Center for Culture and Learning to offer two week-long workshops focusing on the Delta’s rich cultural heritage in June and July of 2015. Each workshop will serve 40 K-12 teachers who will come from Mississippi and across the U.S.
Classroom teachers in public, private, parochial and charter schools, as well as home-schooling parents and school librarians, are eligible to participate. They will receive a stipend to assist with expenses and gather with leading humanities scholars and Delta State staff to develop powerful lesson plans relating to the Delta’s heritage and the heritage of their own home regions. The workshops are titled “The Most Southern Place on Earth: Music, History and Culture in the Mississippi Delta.” Participants will travel throughout the Delta as they visit sites where significant events occurred. Discussions will focus on civil rights and political leadership, immigrants’ experiences in the Delta, the blues, the great migration, agriculture, the Mississippi River and more. Participants will sample Delta foods, visit local museums and listen to the blues. Field trips will roam as far as Greenville, Greenwood, Indianola, Ruleville, Mound Bayou, Clarksdale, Memphis and stops in between. Brown will return to the DCCL to direct the workshops between June 21-27 and July 12-18, 2015. Each workshop begins on Sunday evening and runs through the following Saturday afternoon. Participants can earn five graduate semester hours upon completion of the workshop. The DCCL at Delta State promotes the understanding of the heritage of the Mississippi Delta. The center will be assisted during the workshops by Delta State faculty members along with faculty from the University of Mississippi, Sam Houston State University, Jackson State University, the University of Memphis and other institutions of higher learning. Local Delta citizens will also tell their own stories and experiences. There are only 21 Landmarks in American History and Culture topics offered during 2015. The topics range from the transcontinental railroad, mining in the far West, the American Revolution in the Northern Frontier and several workshops focusing on the civil rights movement. A complete list can be found at http://www.neh.gov/divisions/education/summer-programs. For more information about the Landmarks in American History and Culture workshops, visit the DCCL’s website at http://deltacenterforcultureandlearning.com/southern-place-workshop/, or contact the center at 662-846-4311. Photo: The opening reception of The Most Southern Place workshop, in the Martin and Sue King Railroad Museum. Photo by Rachel Anderson. The Delta State University Delta Center for Culture and Learning recently welcomed 40 teachers from across the country to its June workshop entitled The Most Southern Place on Earth: History, Music and Culture of the Mississippi Delta. These scholars will be in the Delta for six days, studying aspects of its heritage from the Blues and the Flood of 1927 through the Civil Rights Movement, the Great Migration, and the Delta’s literary and religious heritage. They will sample Delta foods from hot tamales to Kool-Aid pickles, and listened to visiting lecturers. Most of these teachers include Delta stories in their curriculum and some teach classes focused on the Blues, Civil Rights History, or other Delta themes. This workshop is made possible by the National Endowment for the Humanities, through their Landmarks in American History and Culture Program. K-12 teachers from any American school are eligible to participate, and each year, applications come from the entire country. Twenty states are represented in this group including teachers from Mississippi and the Mississippi Delta. The opening reception for this workshop was held at the Martin and Sue King Railroad Museum in Cleveland, and was supported by the Cleveland Nehi Bottling Company, Cecil’s Liquors, Cleveland/Bolivar County Chamber of Commerce, the Parlor Purlers of Calvary Episcopal Church, Rachel Tate and Gregory Cole, Lee Aylward, and Bonnie Brown. The Delta Center for Culture and Learning is the manager of the Mississippi Delta National Heritage Area. For information about the Center, the National Heritage Area, or NEH workshops, contact the Delta Center at 662-846-4311. PHOTO: The students on the Jack and Jill tour, in the chapel at Tugaloo College in Jackson. Photo by Joli Cooper. The Delta Center for Culture and Learning at Delta State University recently helped Jack and Jill of America, Inc., a nation-wide African American family organization, plan its Mississippi Freedom Trail Tour. This was the group’s first tour in Mississippi, and their eighth annual tour of America. Parents and children spent time in Jackson, the Delta, and Philadelphia, MS. While in the Delta, the group learned about the murder of Emmett Till at the Emmett Till Historic Intrepid Center in Glendora; talked with Mr. Charles McLaurin about the life of Mrs. Fannie Lou Hamer, and learned about Amzie Moore’s life from Mrs. Margaret Block. They also toured Mound Bayou.